Like all anthologies, Neo-Parasyte M is a mixed bag. The stories range from eye-rolling-ly bad comedy, such as Peach-Pit’s “Teach Me! Ryoko Tamiya Sensei!”—a comedy strip which exploits the puerile humor incumbent to having a sentient being inhabiting the right hand of a young boy in throws of puberty—to action packed installments speculating on possible futures for the parasytes and mankind, such as Hiroki Endo’s “Edible”—which recalls classic action/sci-fi films like Aliens or The Thing. Among these are a few which really set themselves apart from the rest of the offerings. Among these are the anthology’s opening story by Moto Hagio, “Through Yura’s Gate,” which follows up on one the hanging plot threads from Hitoshi Iwaaki’s original series. Unlike many of the installments in the anthology, Hagio spends quite a bit of time developing the inner lives of the two main characters, which makes the ultimate reveal that much more emotional when it’s time comes. Most of the contributions don’t have the same room to breathe and instead go for a one note joke or intense action scene. One of the later is Ryouji Minagawa’s “Perfect Soldier,” which gives us a glimpse into a possible future where the parasytes find themselves drawn into the wars of humanity. Minagawa does an amazing job at setting up the philosophical core of the story in a short amount of time, while interweaving some really creative and intense action sequences at the same time. The result is one of the collection’s most memorable and enjoyable stories. Arguably the most remarkable entry in Neo-Parasyte M isn’t from a manga creator at all, but from modeling artist Takayuki Takeya. While the name may not mean much, American fans who follow Japanese pop-culture may have already encountered his work; he was the lead designer on 2016’s Shin Godzilla, in addition to redesigning various Kamen Rider figures for the S.I.C. toy line. Takeya’s tale, “Granny’s Regrets” is one of two full color entries, and is the only photo-comic in the book. Comprised of what appears to be full page photos surrounded by the main character’s internal narration, it presents a disturbing series of images of a parasyte in various stages of transformation before coming to an abrupt and darkly humorous, twist ending. 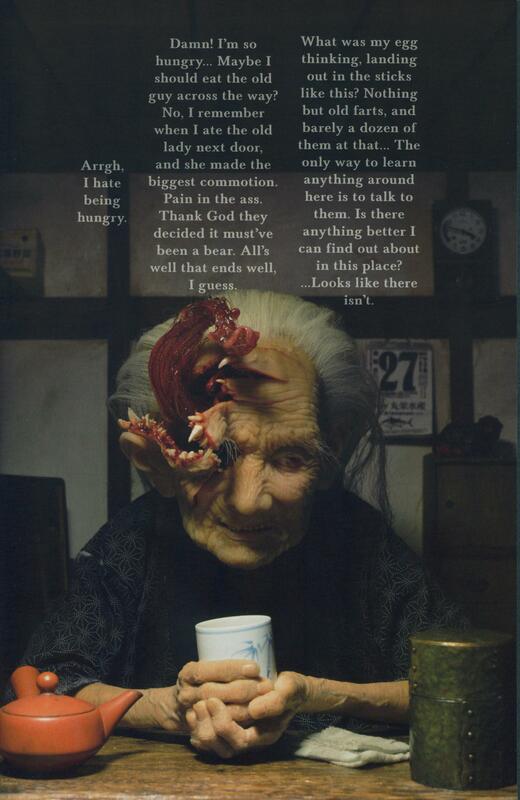 Photo comics rarely seem to make much an impression or generate much interest, and often come across and stiff and lifeless, but Takeya’s modeling of an old woman possessed by a parasyte did an absolutely amazing job at creating some the most disturbing visuals in the franchise to date. The visuals are deeply unsettling and are sure to stick with readers after they’ve put the book down. While one might be reluctant to revisit the short story due to it’s grotesqueness, multiple rereadings should generate a new appreciation for the craft that went into the model’s creation. In the end, not only is it a wonderfully disturbing read, but it’s also a tantalizing glimpse into what a live action Parasyte adaption could look. In the end, Neo-Parasite M is a worthy successor and companion to Neo-Parasyte F. The stories are interesting explorations, extrapolations, and postulations of what might have been or could have been in the Parasyte universe. While not every story is amazing, there are more than enough hits to make the volume an enjoyable read. 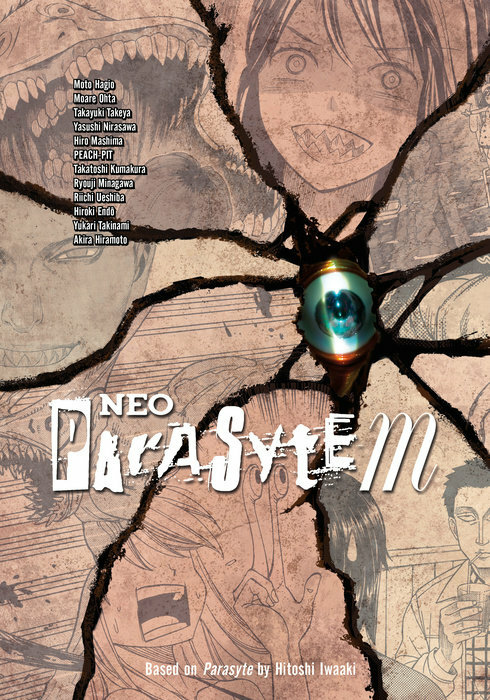 Neo-Parasyte M is available now from Kodansha Comics. Review copy provided by the publisher.